This archive article was originally published in the Anniversary 2015 issue of Antiques & Fine Art magazine. Since the colonial period, the Atlantic Ocean has operated both as a barrier between America and Europe and as a conduit for international exchanges of peoples, goods, and ideas. It spurred commerce and enterprise that was the basis for both national economic activity and personal fortune. The activities in America’s great harbors and port cities also supported the nation’s cultural development, prompting the rise of schools of maritime and landscape painting, as well as portraiture. The exhibition The Coast & the Sea: Marine and Maritime Art in America explores these themes and the breadth of experiences through which artists and their audiences engaged our coastlines, while simultaneously highlighting substantial developments in American artistic currents. With fifty-two paintings and ten maritime artifacts dating from the eighteenth- through the early-twentieth centuries, the exhibition illustrates the sublime drama of the oceanic environment; the importance of America’s early naval battles; breathtaking vistas where water, land, and light meet; and depictions of the men and women who animated Northeastern port cities. This rousing battle scene from the Revolutionary War records an important early naval engagement on the Hudson River in October 1776. British ships broke through the American defenses at what is today Washington Heights to gain command of the lower Hudson. HMS Tartar, Roebuck, and Phoenix are shown under American fire from Fort Washington on the east bank and Fort Constitution (today Fort Lee) on the west. 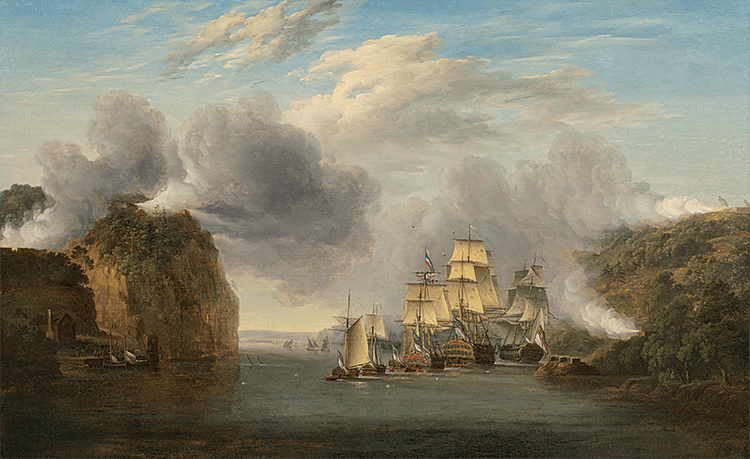 This large painting is a careful copy by William Joy after a trio of paintings by the British naval artist, Dominic Serres the Elder (1722–1793). Three replicas of the subject were commissioned from Serres by the captain of the Phoenix; one for the commander of each victorious frigate. 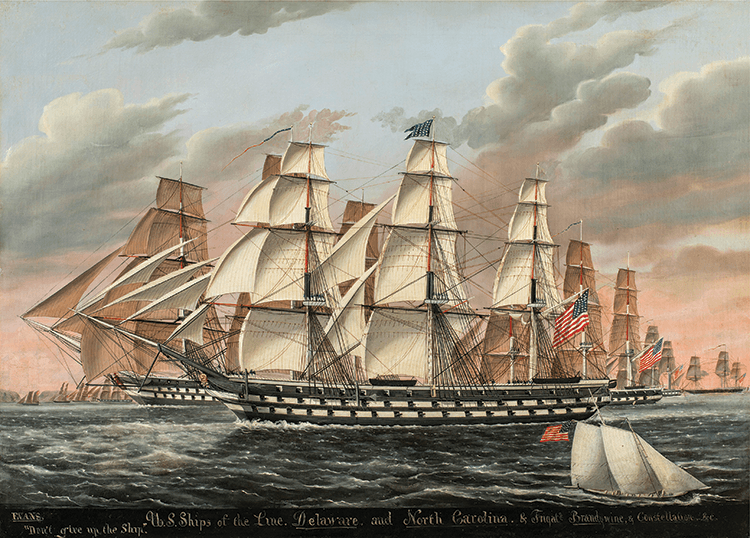 The English marine painter Thomas Buttersworth applied the traditions of Anglo-Dutch maritime battle painting to key naval engagements between the United States and Great Britain during the War of 1812. His skillfully conceived battle subjects gained their widest currency in America as prints, after which many copies were made by other artists. However, the command with which the artist represented the powerful drama of heroic ships in combat at sea is best appreciated in brilliant paintings like this one depicting the action of the USS President and HMS Belvidera on June 23, 1812. 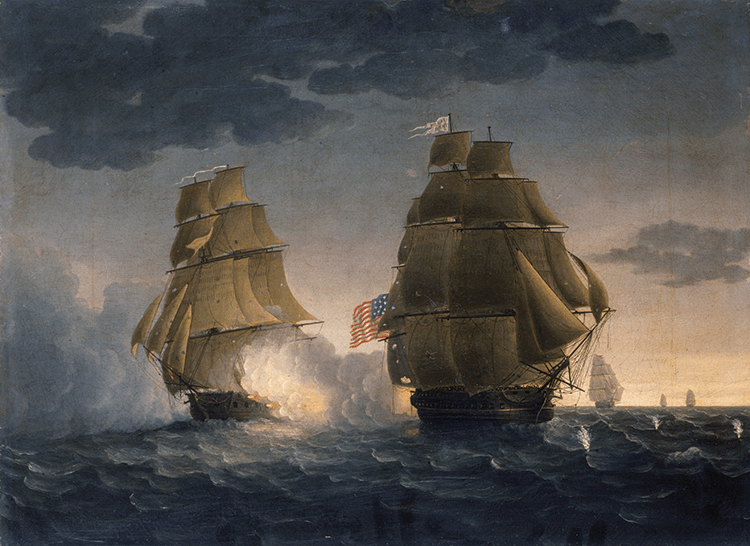 This splendid work celebrates American military power and national identity in a brilliantly colored maritime pageant recording four vessels of the United States Navy under full sail. The Delaware and North Carolina each mounted seventy-four guns and were ships-of-the-line, so called because of the customary line of battle formation. Opposing fleets formed lines and sailed parallel while firing at each other. The fleet with the heaviest broadsides usually won. The Brandywine and Constellation, carrying thirty-six and forty-four guns, were frigates. These mighty warships, assembled on canvas as if parading in a naval review, embodied the nation’s pride. Evans inscribed the names of the vessels along with the naval slogan: “Don’t give up the Ship,” Captain James Lawrence’s famous battle cry from the War of 1812. The vast protected harbor at the mouth of the Hudson River established New York City as a great port and the nation’s commercial and shipping capital during the nineteenth century. 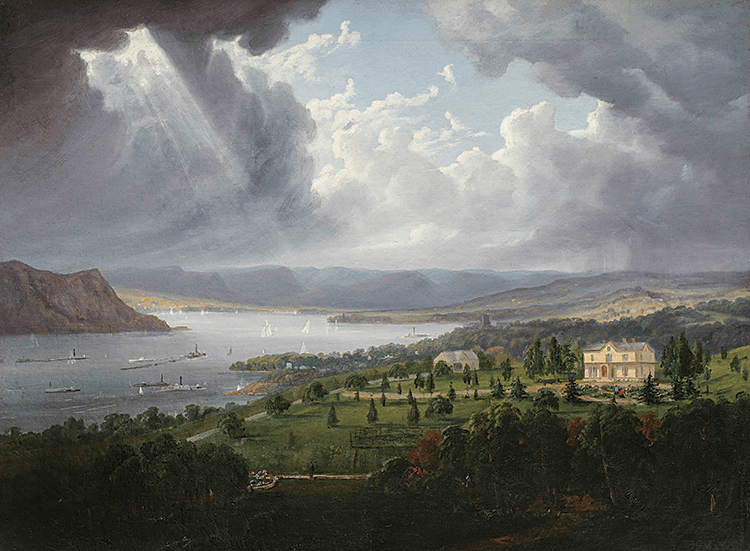 Havell portrays the broad estuary of the Hudson River at its widest point, where sailing craft and steamboats populate the Tappan Zee. While the busy river carried maritime traffic of all kinds, the Hudson’s banks also provided magnificent views for cottages and villas, signaling the rapid development of the upper Hudson as a suburb for New York City. 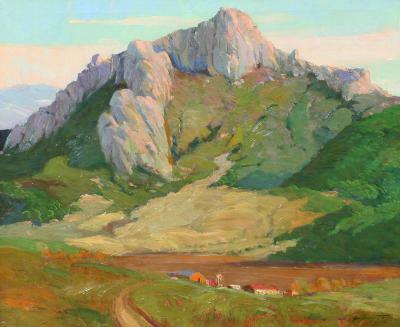 The scenic attractions of the Hudson’s entire course were celebrated in paintings, prints, and literature, quickly becoming famous as a popular picturesque travel route. Thomas Birch was considered the country’s first specialist in marine paintings. 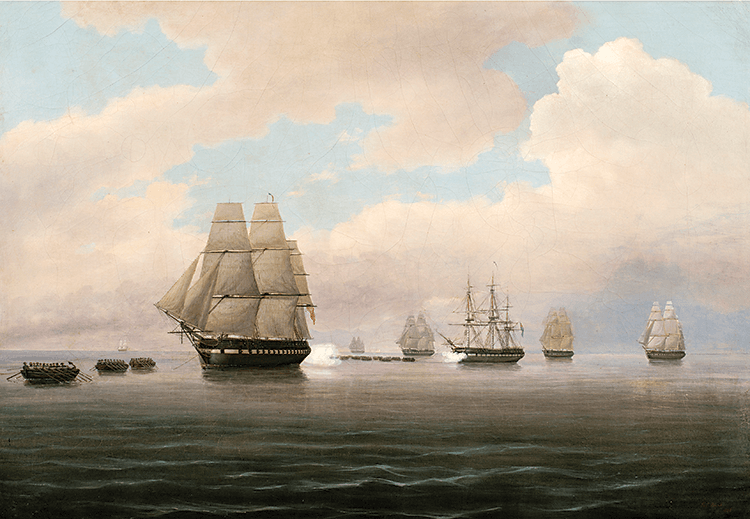 This work portrays the daring escape of the USS Constitution from the British fleet during the War of 1812 and was commissioned many years later by the ship’s commander, Isaac Hull. The Constitution sailed out of Chesapeake Bay in July 1812, shortly after the outbreak of the war, en route from Annapolis to New York. Off the New Jersey shore on July 17, Captain Hull encountered a British squadron, which gave chase. With skillful seamanship, Hull kept the Constitution ahead of the British for two days, even towing his ship after the breeze died down. Toward sundown on July 19, a favorable wind enabled Hull to slip away from his pursuers. Birch documented Hull’s naval maneuvers by showing a trio of longboats, the leader bearing the kedge anchor used to tow the ship while exchanging fire with the British in close pursuit. Stearns combined both genre and portrait painting in a series of fishing subjects, where sportsmen angle along rocky trout streams. 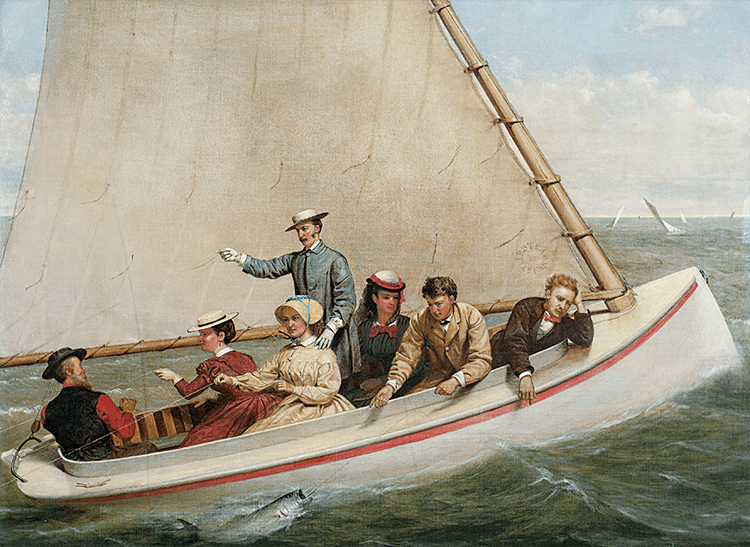 Only a few works portray saltwater fishing; this scene is the only one where ladies join the party on a fishing expedition off the southern coast of Long Island. Costume distinguishes the local mariner who pilots the catboat from the fashionable tourists who fill his boat. The gently humorous episode evokes the popularity of seaside leisure in the latter decades of the nineteenth century. 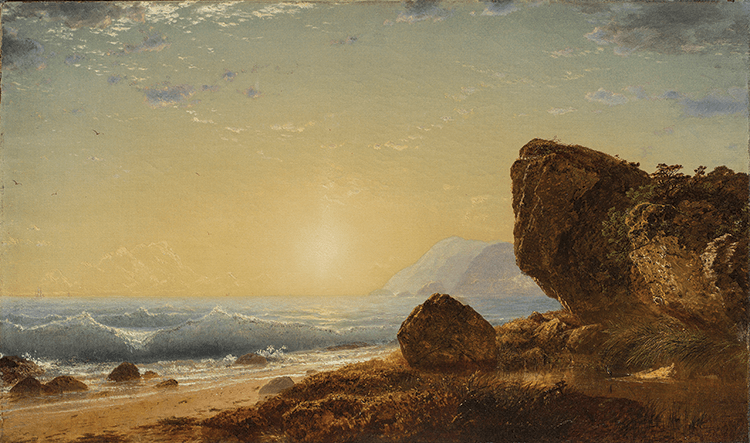 Kensett was one of the first major landscape painters to develop a strong interest in painting coastal terrain, a subject whose popularity grew as seaside tourism developed in the second half of the nineteenth century. The luminous Sunset on the Coast depicts an isolated coastline unpopulated but for a solitary waterfowl. Distant sails on the horizon do nothing to dispel the sense of seclusion on a remote shore bathed in the glow of the setting sun. Silva typically focused on remote stretches of river and coast, like Off City Island, New York, where he was able to exploit the great expanse of open sky and the fleeting effects of weather and the time of day to create poetic waterscapes. In this panoramic vista, luminous waters reflect becalmed schooners and sailboats. City Island, then a seaport community of oystermen and shipbuilders, lies in Long Island Sound, off the east coast of the Bronx and on the shipping channel via the East River from the Sound into New York harbor. M. F. H. De Haas was born and trained in Holland, where he enjoyed great success as a maritime painter with an artist’s commission in the Dutch Navy. American ambassador August Belmont persuaded him to immigrate to the United States in 1859. Settling in New York, De Haas quickly gained renown as “the foremost marine painter of America.” His painterly skills are well demonstrated in Tropical Sunset at Sea, where the sails of a splendid vessel are dramatically silhouetted against a spectacular sunset. Both the setting and the romantic title evoke the thrill of seafaring adventure in exotic and faraway places. 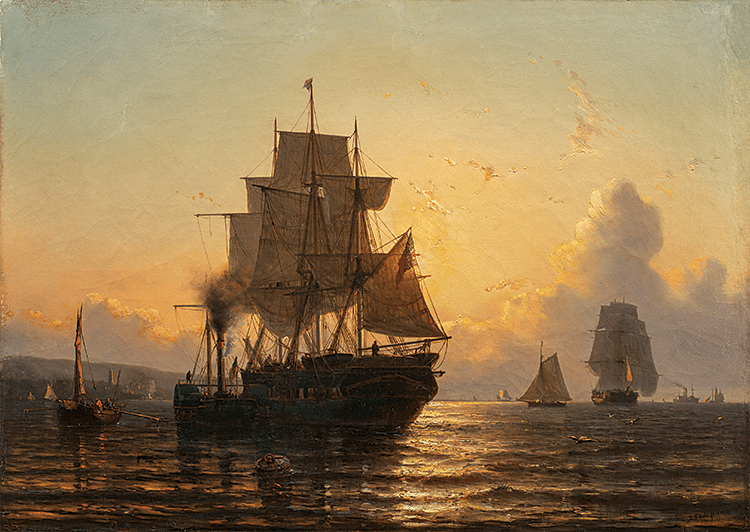 The Coast & the Sea: Marine and Maritime Art in America is a traveling exhibition from the New-York Historical Society. 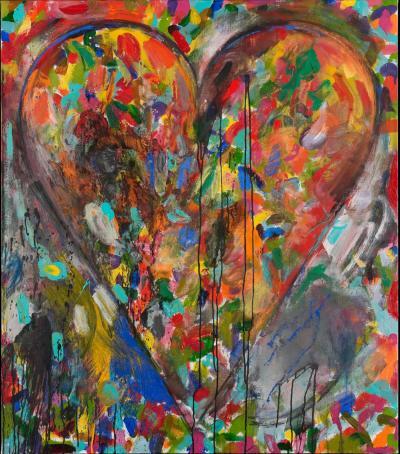 It will be on view at the Portland Museum of Art, Portland, Maine, from January 30 to April 26, 2015. 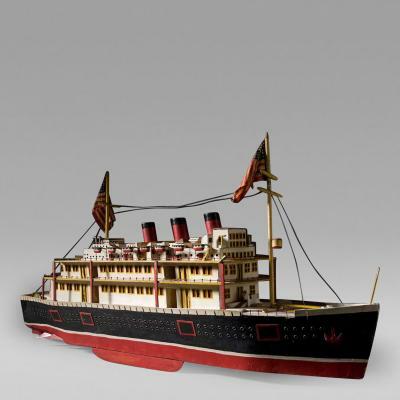 It then travels to the Mattatuck Museum in Waterbury, Connecticut (June 6–September 3); and the New York State Museum in Albany from October 24, 2015 to February 22, 2016. The exhibition is accompanied by a catalogue published by the New-York Historical Society and D Giles Limited, London. Linda S. Ferber is the senior art historian and museum director emerita at the New-York Historical Society. This article was originally published in the Anniversary 2015 issue of Antiques & Fine Art magazine, a digitized version of which is available on afamag.com. AFA is affiliated with InCollect.com. All images courtesy, New-York Historical Society. Fawn Galli Offers Up Inspiration and Information In "Magical Rooms"